and excellent perdiz hunting over quality bird dogs. At one time Estancia El Rincon — which extended to over three million acres — was one of the largest ranches in Argentina. Our outfitter, River Plate Wingshooting, refurbished and upgraded the original home, built in 1890, to restore it to the glory of its early days. Action-filled days, impeccable organization, attentive personal service and highly competent guides place El Rincon and its sister estancia, Santa Rosa, at the absolute top above ALL other Argentine mixed-bag lodges. The lodge is located in low lying country between the great Uruguay and Parana rivers which border Entre Rios Province (Entre Rios means “between rivers”). Vast fields of rice production and River Plate’s supplemental feeding program maintain an almost unbelievable population of ducks of up to twelve species. Travel to the blinds usually ranges from 20 to 40 minutes, and most are dry or easily accessed. The variety of shooting topography includes potholes, marsh, river and delta settings. Limits are quite liberal. This is the best duck hunting ON EARTH. Eared doves provide the ultimate wild-bird shooting experience. Decades of expansion of corn, wheat and sorghum in Entre Rios Province has resulted in an explosion of the eared dove population. It’s common for an aggressive gunner to go through 30—40 boxes of shells in the winter-shortened afternoons—after the best duck hunt of his life that morning! 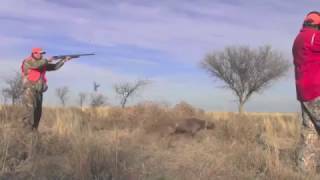 Gunning for wild perdiz (spotted tinamou) over well-trained Brittanies, English pointers and setters and German shorthairs is a River Plate Wingshooting classic. This is a true gentleman’s sport, providing the pleasure of watching a careful Brittany or Setter work out the scent and pattern of each individual bird, capped by an explosive flush and flight. The terrain always allows easy walking in short grass pastures with no brush. Hunters can expect to shoot a limit of 10 perdiz each in 1-2 hours. As our hunters are guests at the historic headquarters of a century-old working ranch, they can revel in all the amenities of modern living while living amid the ambience of rich historical association—one of the main charms of a trip to Argentina. Long-time and popular host Kiki Young provides fine cuisine, an excellent bar, robust Argentine wines and flawless and genuine service. The lodge has eight bedrooms and five baths on two different levels. Buenos Aires is best reached from Miami, Atlanta, Dallas/Fort Worth or Houston on American Airlines, LATAM, Aerolineas Argentinas, United Airlines, or Delta Airlines. Guests are met upon arrival in Buenos Aires and transferred via private vehicle three hours to the estancia. Rates: $1290/night (subject to change). Included are accommodations, all meals, open bar, land lease fees, all services of professional guides, round-trip airport transfers and Argentine hunting permit. Not included are commercial air travel, gun rental at $70/day, shells at $15/box and tips.